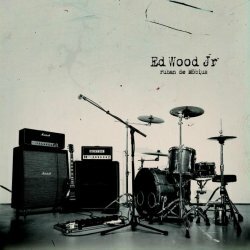 This first longplayer by guitar and drums duo Ed Wood Jr from Lille in France is another fine example of how even a reduced line-up can come up with music broadly transcending the constraints of noise rock. The lack of a bass guitar does occur, but looped guitar sequences make sure that the songs never sound too empty. Named after the famed director of B-movies from the Fifties, Ed Wood Jr fortunately lack his dilettantism, but the two musicians wanted to confer the idea of how to make something worthwhile with limited means. And it works just fine! Combining grating noise rock with reflective post rock arrangements and occasional jazz excursions, the songs display enough variety to make them interesting throughout the album. The music is quasi-instrumental, apart from some vocal samples and rare outbursts that have more in common with screaming than with singing, but fit all the same. While not reinventing noisy post rock, Ed Wood Jr have still impressively shown how much suspense you can create with just a guitar, a drum kit and a couple of effects. A little time after Ruban de Möbius, Ed Wood Jr are already back with a follow-up EP which offers three tracks from the longplayer in reworked versions. The duo has hired the services of some guest artists to add a different flavour to their originally more sparse songs. On the opener Zemzan, we get to hear Nico from Cercueil and Bastien from Tank. On Art Brut, Mathieu Deprez aka Contrebasick shows up, while the final Russian titled track features Ben from Klang. Apart from Cercueil, those names mean not a lot to me, but all of them are able to enrich the material. While the original takes took their pride from their minimalist instrumentation, we now get bass guitars, and maybe that’s just my rock’n’roll upbringing, but I feel immediately more at ease when there are some truly low notes carrying the music. 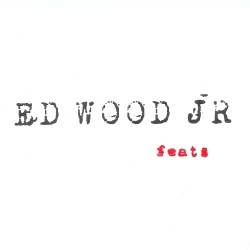 The new interpretations on Feats give Ed Wood Jr’s music a much stronger sense of dynamics, and I would really like to see the band recruit a fulltime bass player to help them get even more out of their ideas.